Our family recently made the difficult decision to euthanize our family dog of nearly 17 years. I am sharing our experience to hopefully help others struggling with the big question of “when is the right time?” While I have helped many people to answer this question throughout my career, it somehow didn’t seem so clear-cut when it came to Albert. He charged into our lives as a 4 lb ball of terror during my last year of veterinary school. 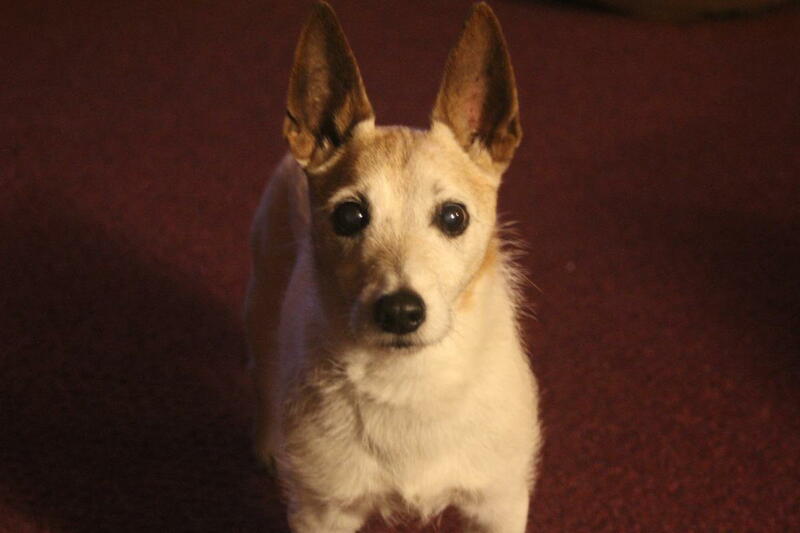 He joined our other Jack Russell Terrier at the time and rounded out our family. Some of the events that we shared with Albert included: transitioning from vet student to veterinarian, the births of our three children and all of the late-night struggles of caring for newborns, late night emergency calls, the death of my mother, chasing geese from our pond, Christmases, birthdays and the list goes on. How do we let go of a dog that has been there with unconditional love for all those special moments and difficult struggles in our lives? Albert had a slowly-progressive, degenerative neurological disorder that was affecting his ability to walk. The good news was that pain was not an issue. The bad news was that he couldn’t run and jump like he always had. He needed help with steps and had to be blocked from stairs to avoid falls. Months went by, and he continued to get slightly worse. The hard part was that it was so gradual. He was losing muscle tone and needed a lot of help and extra care. This was not a burden and all of us made sure that he had what he needed. All three kids learned what it meant to care for an aging pet and showed the extra effort to make sure that Albert was safe and comfortable. We enjoyed one last Christmas with Albert. He ambled through the gifts and wrapping paper like he had done for the last 17 Holidays. We celebrated the New Year with him snoozing on his bed. I began discussing the need to let him go with everyone. The things we had to ask were related to his quality of life. We discussed the things Albert always loved to do and whether he still did them. Chase and catch a racquetball like a boss?! Not anymore. Bolt around the pond to the opposite side and bark like a mad-man at the Canada Geese? Nope, not last summer. Roll around the living room and scratch his back with all four feet in the air? No. Not anymore. Having his neck scratched and ears rubbed? Didn’t seem to enjoy. He couldn’t see or hear us anymore. We decided it was time. Our family surrounded Albert that night. I explained what would happen so that everyone knew what to expect. Everyone said some nice words, and I administered the solution that would allow him to pass peacefully. While it wasn’t easy on any of us, and we miss him dearly, we gave him the gift of peace. We decided as a family that it was the best thing for Albert even though we didn’t want to let him go. If you are struggling with this decision, don’t hesitate to reach out and ask for guidance. Your veterinarian is a good resource. We can’t make the decision for you, but we can offer you some options based on your pet’s condition.